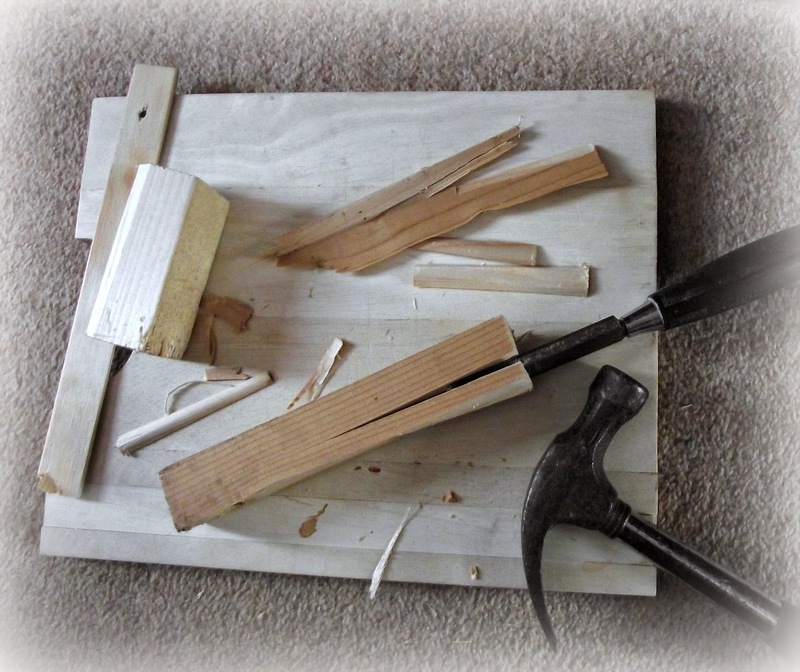 So I began by splitting up the wood in to irregular shapes and oh boy did I make a mess! I then painted the wood "shapes" with white acrylic paint and put to one side. 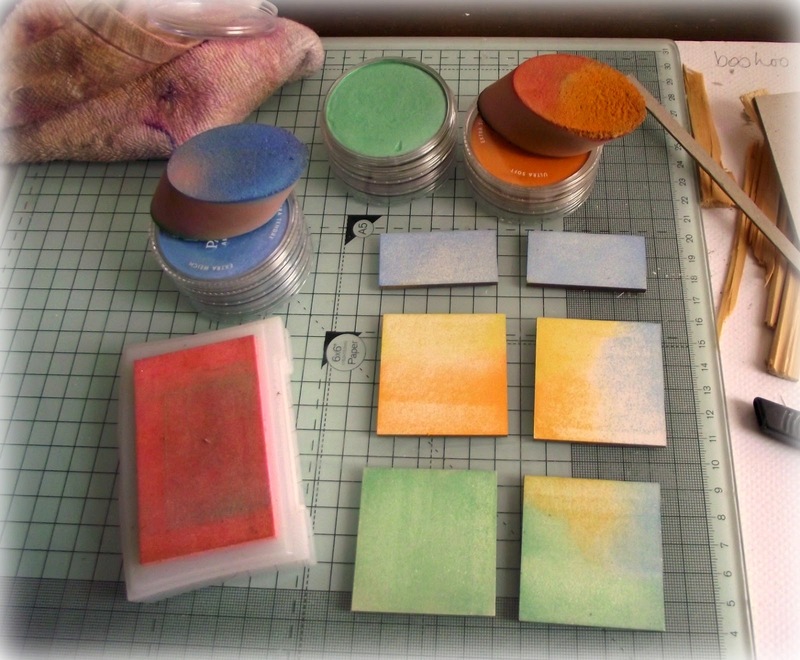 Next I took my stampbord pieces and began covering them with my pan pastels. 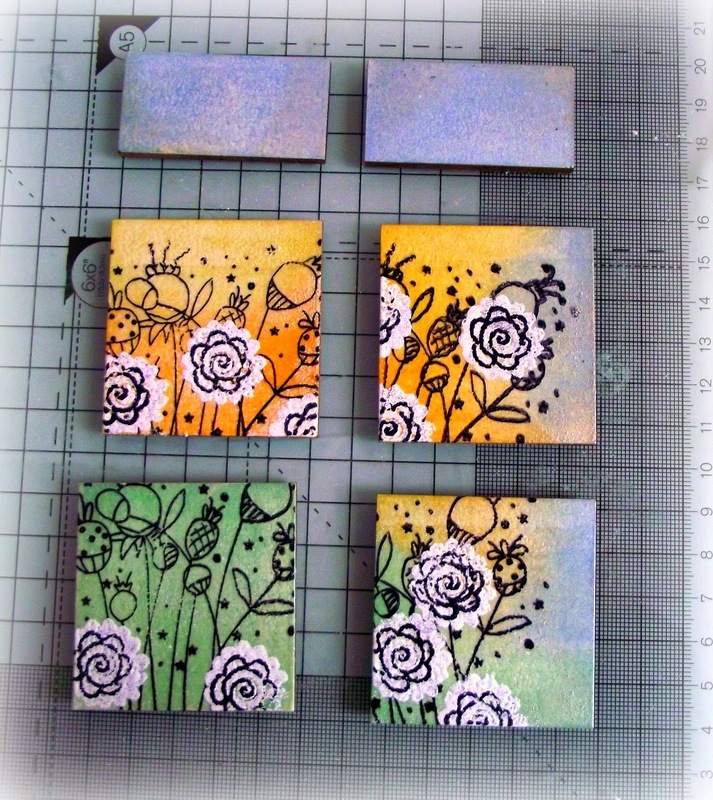 Next using the Premium Craft brands Roses stamp set, I created a floral theme. Lots of over stamping and embossing, and then finally covered each of the pieces with ultra thick embossing powder. I layered the pieces on to my background and then came the wood ... I was so engrossed at this point, I have even forgotten to eat my biscuits! I have put the wood pieces down to create a window effect securing them with my hot glue gun. The top part has a gap because this is where I wanted to hide my curtain. Once this was in place, I covered the gap with another piece of wood. I also decided the background was "too loud" so lightened it with white coarse pan pastel. next came the decorating ... and I had great fun rummaging through bits and bobs in my local charity shops to find my items. The sentiment has been stamped on to a stampbord coloured with pan pastels. The vase is a thimble covered in white acrylic paint and ribbon roses placed inside. 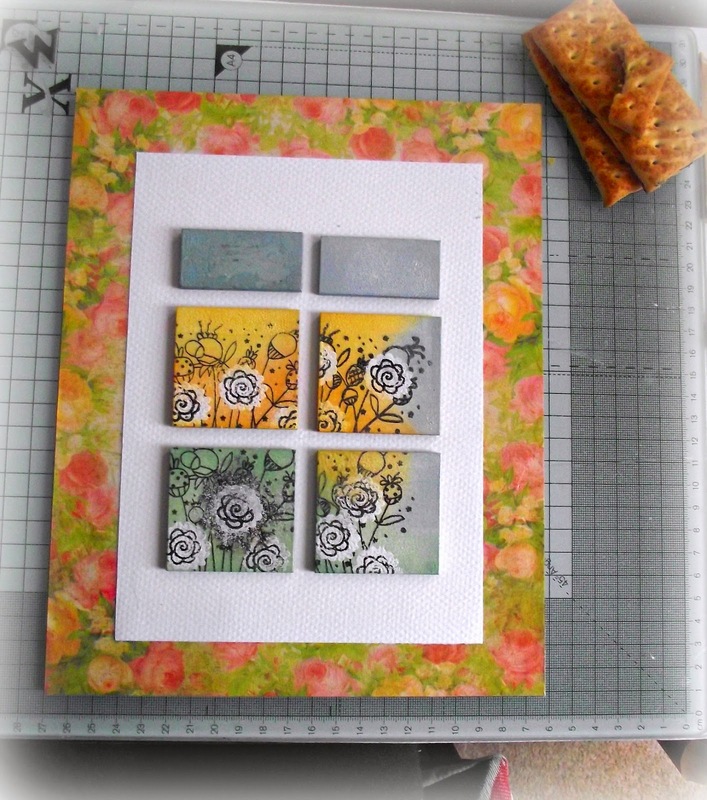 The little picture is another piece of decorated stampbord, with other rummage finds. The postcard I found in a drawer I have full of ephemera bits for my projects, along with the acetate clock and charm. Think that's everything and I thoroughly enjoyed myself from the very start to the end. I really need to do more of this free style crafting as it was extremely liberating. this is gorgeous Lou also your card under. This is gorgeous, so much detail. You have got me thinking about doing things with lolly sticks I bought now! Oh my gosh Lou! This is beyond epic! This is beauty beyond words and what a skill to work with small wood pieces. Very clever and inventive. I love every bit here.Thanks for sharing this with us at Rhedd's Creative Spirit this month. Good Luck, Rupa, DT. Wow! I LOVE your project! Thank you for sharing with us at Ruby's Rainbow Challenge. Wow! I get to visit your awesome project again! Love it! 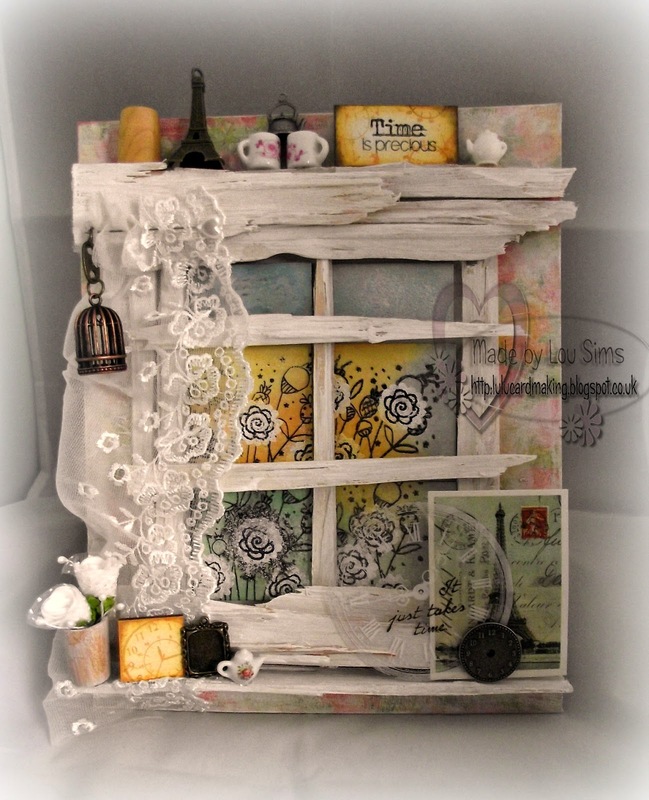 Thank you for sharing with us at Altered Eclectics Challenge. Wow! Lou, this is absolutely stunning, hun - I have so many adjectives to describe it, I wouldn't know where to start! What a fantastic way of recycling what others would simply call rubbish! I love the contrast between the bits of old wood and the softness of the Pan Pastels, and all the little trinkets look fab. 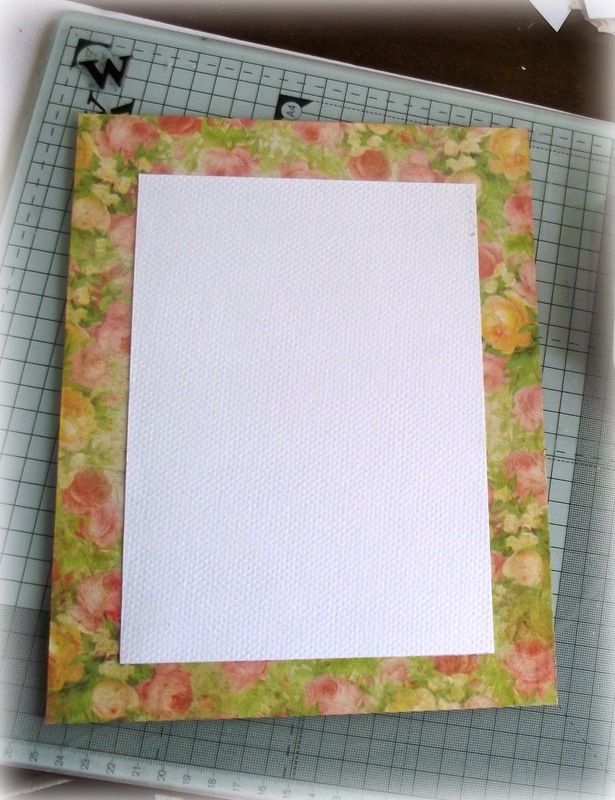 Thanx so much for entering our 'Distress It' challenge at Fantasy Stampers. WOW this is amazing! You are so talented! Lou, I really have to say, your piece is just amazing. 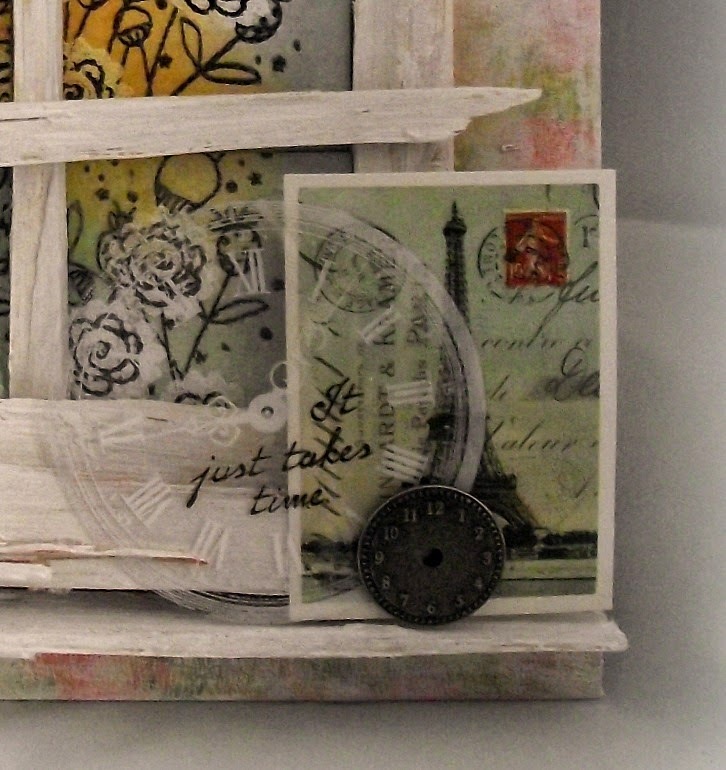 At first glance I though it was a shadowbox, but after reading your post, I am even more impressed by your imagination and your ability to recognize the potential of something so fabulous from a few scarp off cuts. 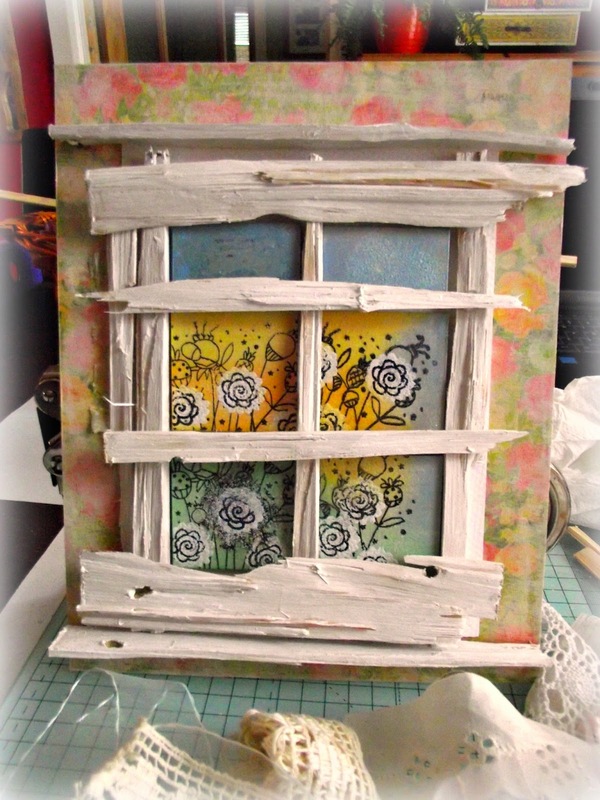 Thank you for sharing your wonderful piece in our May challenge over at Recycle, Re-Purpose & Re-Invent. Sorry this comment is so late in coming and it was a pleasure to come see your project up close. This is fabulous and such great imagination - beautiful. Thank you for sharing with us over at Altered Eclectics this month and hope to see you again in future challenges.